Todd and Lisa Hatz's lower-level redo demonstrates the many ways a fireplace warms up a space. 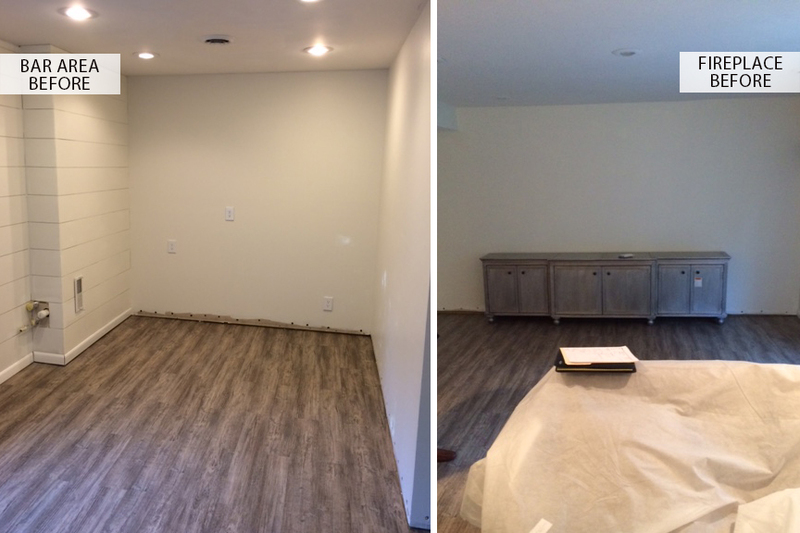 After 17 years in their O’Fallon home, Lisa and Todd Hatz were ready to rejuvenate a lower level that had outgrown its original purpose and outlived the trends of the time. By January 2016, it was time to bring the space into the 21st century and out of its cold demeanor. “Before the renovation, the space served primarily as a play zone for our dog and an area for our daughters to play, complete art projects and paint. Over the years, our daughters outgrew their need for a ‘play area,’ and we fenced in our back yard to provide our dog a safer place to run and retrieve,” Lisa says. So, as the family’s needs changed, the Hatzes opted to make that area a place where she, Todd, daughters Whitney and Ella, and their lab Fern could all gather to watch movies or take in a basketball game. That meant a TV area, fireplace and bar, to cover all the bases in a space meant to entertain. Lisa and Todd found inspiration from the popular HGTV show “Fixer Upper,” and culled ideas from shelter magazines, Houzz.com and some of the beautifully decorated beach homes of Florida. 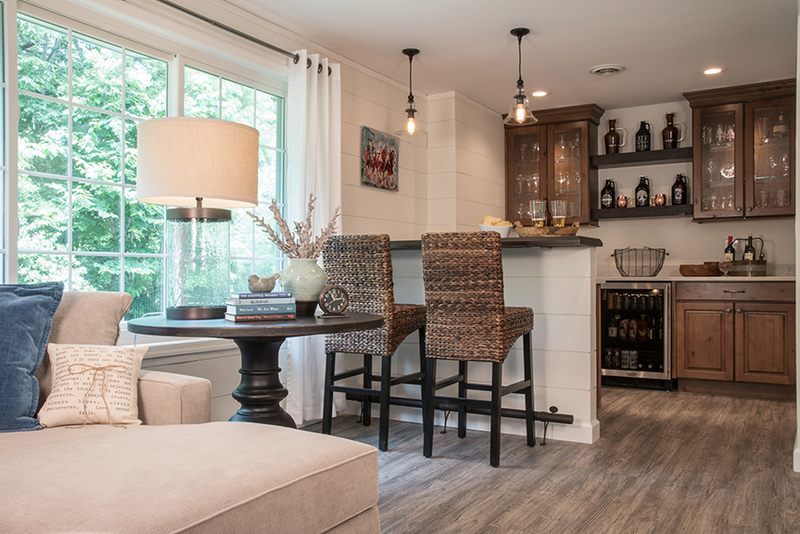 Rich woods, custom cabinetry, clean white countertops, floating shelves and smartly curated metal fixtures were must-haves, and Jeanne Liston of Liston Construction Company knew just how to combine them to create a room with the character and warmth the couple wanted. Todd marvels at “one of the most beautiful fireplaces we could have hoped to have” in the approximately 700-square-foot space. “It was custom built by Liston's fantastically talented trim carpenter out of authentic reclaimed barn wood, and the mantel is bronzed iron. 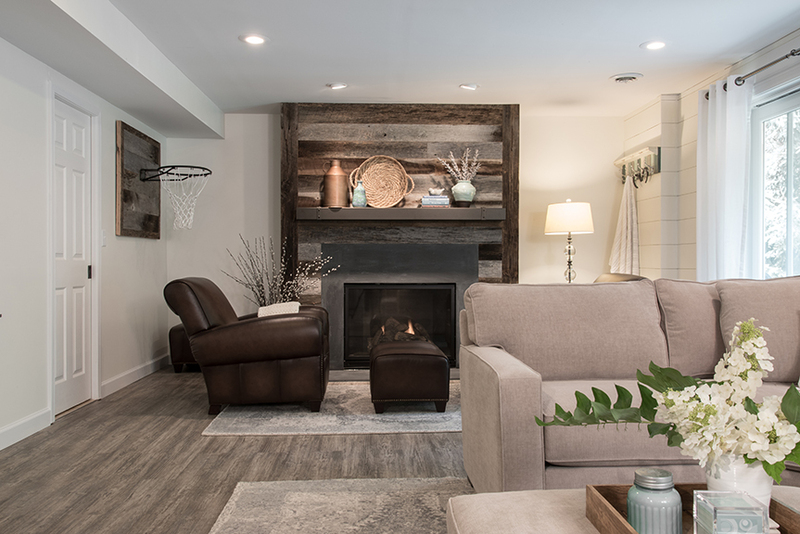 That fireplace is truly a work of art.” Included in the design is a shiplap backboard, which was also used to create an antique basketball goal to satisfy a houseful of hoops enthusiasts. 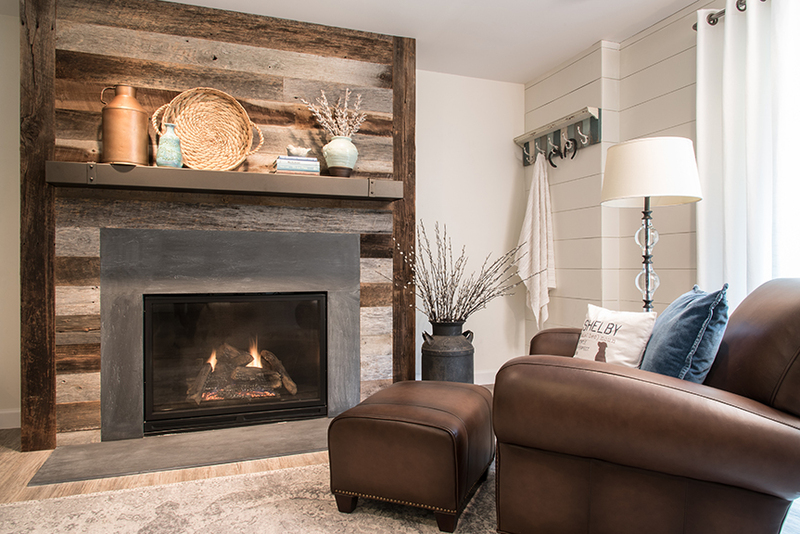 The opposite end of the room mirrors the fireplace wall, with antique shiplap, an espresso -stained walnut top and knotty alder distressed cabinetry creating a fun and relaxing entertaining zone. “The overall vibe is a rustic elegance that is light and airy, while also providing a cozy and inviting atmosphere,” says Todd. The Hatzes went into the month-long remodel with firm but flexible ideas, and credit Jeanne Liston with taking their desires to heart in her design. For Jeanne, the family’s vision and early prep work provided a great template for her own team’s creativity.